Wherever you see a farmers’ market, you’re bound to find kettle corn. We enable parents of small children to buy fruit and vegetables in the farmers’ market by enticing their young ones with a bag of hot, wonderful kettle corn. The alluring smell of the freshly popped corn invites passers-by to come into the market. And the battery of mini explosions in the kettle always attracts a crowd, adding to the festive atmosphere of the market. " Before 1977, farmers’ markets were not permitted to legally operate in California. Farmers could not sell directly to the public. During an unprecedented surplus in the 1977 peach harvest, the excess peaches were left to rot due to the strict regulations preventing farmers from selling directly to the consumer. In protest, the farmers dumped the rotting peaches on the lawn of the state capitol. California governor Jerry Brown responded by relaxing the guidelines to allow farmers to sell their produce at special markets, now known as certified farmers’ markets. 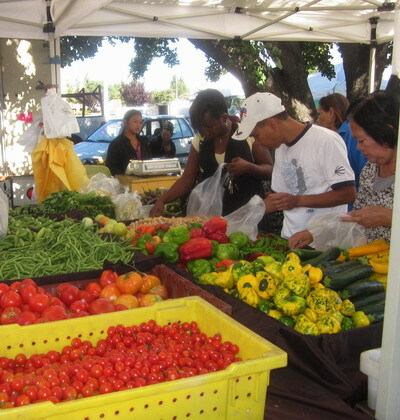 The Gardena farmers’ market was launched in 1979 to provide a venue for farmers to sell their goods directly to consumers. The market benefited small, family-run farms, giving them the opportunity to remain competitive as the agricultural industry became increasingly commercial. Starting from these humble beginnings, the movement has quickly grown into a vigorous statewide network of over 700 weekly markets. Nationwide, by 1994, there were a reported 1,755 farmers’ markets in operation across the country; by 2006, that number had grown to 4,385, and by 2009 to over 5,000. According to the 1996 USDA Farmers' Market Survey report, national fruit and vegetable sales through farmers’ markets exceed $1.1 billion per year. More than a million customers visit farmers’ markets every week. One quarter of this activity ($250 million annually) is in California.